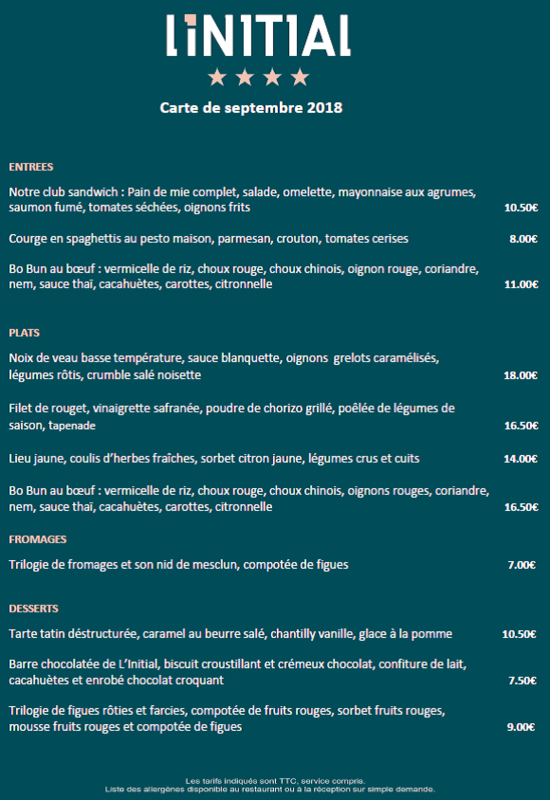 La Table de L’Initial offers a traditional cuisine made of seasonal and fresh products. Our Chef will surprise you thanks to the refreshing combination of simplicity and refinement. Two different atmospheres for two different moments: relax and cosy for lunch, stylish and intimist for dinner. La Table de L’Initial welcomes you for lunch and dinner, from Monday to Friday. Up to 50 seats in the restaurant and 20 extra seats on the terrace. Our formulas: A la Carte (changed each month) or Menu of the day. No matter your wish, for a meeting or a relaxing moment, our bar welcomes you everyday from 7.00 am to midnight. Soft drinks, beers, aperitifs, wines, digestives, hot drinks are served in the lounge of the lobby or on the terrace. For coffee fans, we offer a large range of grands crus coming from every part of the world. Whisky lovers will also treat themselves thanks to our preferred selection.